It is an odd state of affairs that it is easier to find out the ownership of land in 1915 than it is in 2018. The Finance Act of 1910 (Lloyd George’s famous People’s Budget”) proposed an increment levy on the increase in value of land. To establish a base-line of values, surveyors mapped out in intricate detail, the ownership, occupation, value and use of virtually all of Great Britain and Ireland, covering 99.7% of the land area of Scotland. The map above shows the results for the west of Edinburgh around Charlotte Square. 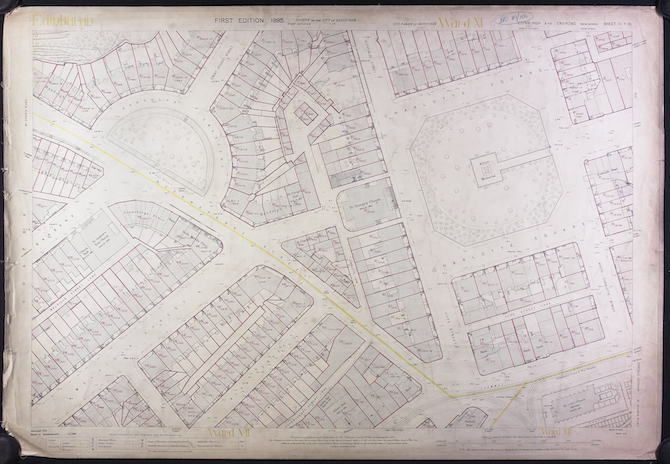 In 2018, with modern technology such as digital mapping, satellite imagery, online technology and smartphones, we have yet to come close to what the Edwardians achieved with paper maps and ink. Across the world, modern technology and integrated data management has delivered land informations systems that provide comprehensive data on land to citizens. From Scotland, for example, you can find out a wide range of information about land parcels anywhere in the US State of Montana. If you want the same data for Scotland, you will be frustrated at every turn, expend an inordinate amount of time and have to pay for it. The question of Who Owns Scotland has been perennial one for decades. John McEwen had a go at answering it in 1979 and it was the focus of my first book published in 1996. In the early years of devolution, I tried to persuade the then Scottish Executive to open up land information to the public but there was little appetite. Since then, I made representations to Fergus Ewing and Parliament during the course of the Land Registration (Scotland) Act 2012 to persuade them to increase transparency and access to land information. In a meeting with Fergus Ewing and the Keeper of the Registers of Scotland in December 2011, I made the case for this but the Minister could barely disguise his contempt for my suggestions and later, in the course of the passage of the Bill flatly rejected the idea that the public should have free access to land information (See col982 8 Feb 2012 Official Report). He also rejected proposals to reveal the beneficial owners of companies that own land although the Government were eventually persuaded to do so in the Land Reform (Scotland) Act 2016, the provisions of which are yet to come into force. But this blog is not about beneficial ownership. It is about access to information that already exists but is difficult and costly to access. The recent history of attempts to open up access is dismal as the following examples make clear. Over the decades I have spent researching landownership, I have developed a range of methods and sources. Although the Register of Sasines and Land Register are the definitive sources, they can be impossible to use in certain circumstances, For example, if you want to know who owns a field at a junction of a country road in Fife, you won’t be able to do so from official sources since you need an address or a name of a person and even the map-based Land Register will often be unhelpful in such circumstances. Key to success in such cases is to find out some information from other sources to enable interrogation of the Registers. One such source is a very helpful online map called Pastmap [http://pastmap.org.uk] which provides information on various elements of the historic environment. If there is a Scheduled Monument located on or near land whose ownership you wish to establish, then a link is provided to the legal documents that are registered in the Register of Sasines. These provide details of the ownership of the land at the time of scheduling. In 2012, however, I noticed that Historic Scotland had redacted the ownership information. See the example (second page) of the Bonawe Iron Furnace Schedule before redaction and after redaction. These documents are recorded and made available to the public in the Register of Sasines (and made available for public inspection in the National Records of Scotland) with no redactions, so why conceal this information on Pastmap? What exactly are the “sensitivities” over this information? And why is Historic Scotland considering removing these details completely in future? Above all, if the Scottish Government is committed (as it claims it is) to transparency, why is it seeking to conceal this information from the one freely available source to the public? Following a report in July 2015, John Swinney announced in October 2015 the establishment of SCOTLIS (Scottish Land Information Service), an online portal that would enable “citizens, communities, professionals and business to access comprehensive information about any piece of land or property in Scotland” The service was developed by Registers of Scotland and launched in November 2017. Here it is. There is no map-search facility, there is no comprehensive information (solely landownership) and, as always, any information you do find, you will have to pay for. Contrast it with the online Montana service above. If you are a business, you can sign up as a business user and get access to an enhanced service. But by no stretch of the imagination is this a system allowing easy access to comprehensive information by the citizen. No wonder John Swinney’s successor issued no media release on the day of its launch. On 1 March 2018, the Registers of Scotland published an Overseas Company Report and a Statistical Report on the overseas ownership of land in Scotland. Against growing demands for greater transparency in who owns land and property across the world, this is presumably Scotland’s contribution. The report reveals the companies registered overseas that own land in Scotland. But this is the tip of the iceberg because it only takes account of land in the modern land register and not the older Sasines register. It doesn’t include any information on how much land is owned overseas (my own research shows that 750,000 acres of Scotland is owned in tax havens posing problems for law enforcement and tax authorities). The Sunday Post published details of the findings on 11 March 2018. And yet, the public are denied access to this data underlying the Overseas Company report because to obtain the report (see Information Sheet) will cost you an astonishing £1560 (the Statistical report is free to download). Even if you could afford this sum of money, if you wished further details of each of the records, you will need to buy this from Registers of Scotland. It will cost you £30 each and if you wish details of all 1700 companies, that comes to a cool £51,000. Registers of Scotland claim that the data is being charged out on a cost-recovery basis (i.e. RoS only plans to recoup its costs from sale proceeds). But this merely emphasises why all of this data should be freely available. Were it to have been so over the past decade or so, all sorts of people would have been able to compile all sorts of reports and analysis within their own resources at no cost to the public purse and to the wider public good. The public deserve access to information about who owns Scotland. It’s time to end the secrecy and the costs and open up all information (environmental, planning, valuation, tenure, ownership) in an accessible manner which is free and easy to use by the citizen. Since 2010, I have been (like a couple of my self-employed writer/activist colleagues George Monbiot and Alastair McIntosh) making an annual declaration of interests, income and tax. Previous declarations can be found at the foot of the About page. Commentators, campaigners and advocacy groups should be open about their interests and income (this story from earlier in 2014 is a good example of why I believe this to be so). I also believe that we have too much secrecy in the UK on matters of income and wealth and that if everyone’s income was openly declared, there would be much less inequality. This is not an especially radical idea. In Norway, details of every citizen’s income, assets and the tax they pay are available to the public and published on this website. As a member of the Scottish Green Party, I also feel obliged to comply with the policy resolution passed at the 2011 Conference on Tax Evasion and Avoidance which encourages corporations and individuals to not use tax havens and to publish their accounts on a country by country basis. In 2016 I was elected as an MSP. I will continue to publish information in this format on an annual basis but have also published a transparency page on my MSP website to draw attention to wider transparency issues in relation to my public role. I am an MSP. My tax return for 2016-17 also includes earnings from writing, research, consultancy, public speaking, investigation, and subscriptions from the whoownsscotland website. My accounting year is the calendar year and so for my tax return of April 2017, it is 2016. During 2016, I earned income from self-employment principally from January to May and following the election, from work completed prior to May but not invoiced until afterwards. For 2016-17, my income was as follows. My total taxable income for the Year Ending 5 April 2017 was £ 62.909 on which I am due to pay tax of £12.906 and Class 4 NI contributions of £331.56 = total of £13,237.56 (see tax HMRC calculation here). During 2016 all of my self-employed income was generated from within the UK. My main clients were NGOs, private companies, law firms, print & broadcast media and royalty payments on my books. I own no land or property. I have 483 shares in Standard Life. I am on the Board of Directors of the Caledonia Centre for Social Development (Company No. 192099 & Scottish Charity No. SC 028485). I am a member of the Scottish Green Party and a number of charitable bodies. (1) MSP Salary is 5 May 2016 – 5 April 2017. The sum is derived from P60 after deduction of pension contributions. (2) Gross Income less outlays & expenses – computers, travel, stationery, telephone, research fees (for example, search fees paid to Registers of Scotland) and other expenses of employment. 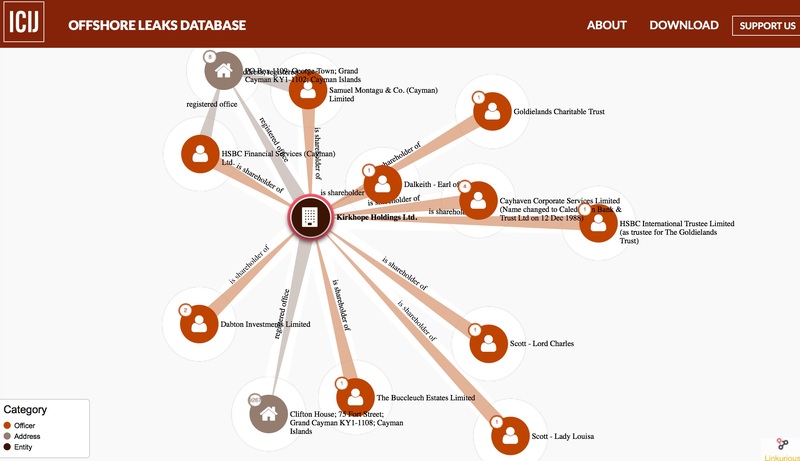 Kirkhope Holdings Ltd. (larger version of the above image here) appears to be one strong candidate for the entity that holds the wealth of the Buccleuch family. It was incorporated in the Cayman Islands on 10 July 1987 and shares are owned by Buccleuch Estates Ltd. and members of the Buccleuch family. Over to whoever wishes to follow this up further. © 2019 Land Matters. All rights reserved.